The Crimebeater multi-point door lock for composite doors has been added to Carl F Groupco’s hardware range. Tested to Secured by Design and PAS 23/24 requirements the lock, manufactured by Fullex, is designed for ease of use, durability and reliability. With flexibility and security in mind, the Crimebeater is available with hook or deadbolt locking points: deadbolts provide a traditional locking solution and hooks offer higher levels of security. The lock is available with a range of faceplate variants including rounded or square ended, made from austenitic stainless steel. 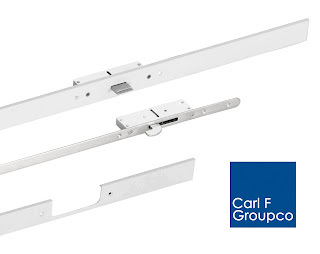 A 44mm white powder coated aluminium face plate lock and hinge cover can be used to finish the composite door – as a result, fabricators can complete the door with lock and hinge plate, saving the cost of applying door trims. Dual spindle or lever operation options are available for the Crimebeater, depending on the end user’s requirements.